FitBit too bulky? Why not glue a sensor array to your skin? The quantified self goes nanoscale with a stick-on silicon electrode network that could not only change the way we measure health metrics, but could enable a new form of user interface. And the researchers behind it aim to have the device available in the next few weeks through a spinoff company, MC10. The development takes wearable technology to the extreme, designed as a non-invasive diagnostic sensor that could be used to measure hydration, activity, and even infant temperature. It bonds to the skin, somewhat like a temporary tattoo, flexing and bending in sync with your skin the way you wish a Band-Aid would. How? Researchers at the University of Illinois, Dalian University of Technology in China, and the University of California at San Diego made it really, really small. 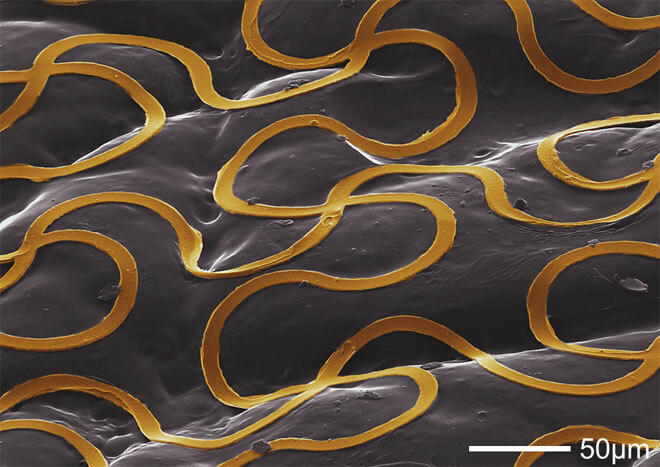 With a thickness of 0.8 micrometers at the widest — around one-thousandth the diameter of a human hair — the thin mesh of silicon actually nestles in to the grooves and creases in your skin, even the ones too small to see. Being small helps, but it’s also important that the silicon is laid out in a serpentine pattern and bonded to a soft rubber substrate, allowing the stiff material to flex, a little bit like an accordion. “Although electronics, over the years, has developed into an extremely sophisticated form of technology, all existing commercial devices in electronics involve silicon wafers as the supporting substrate,” says John Rogers, who led the study published this week in Advanced Materials. Those wafers are mismatched to the body’s mechanics and geometry, he says. The goal here was to develop a system that matches the body more naturally. “By doing that, you can much more easily integrate electronics, either onto the surface of the skin, or on internal organs like the heart and the brain,” he says. 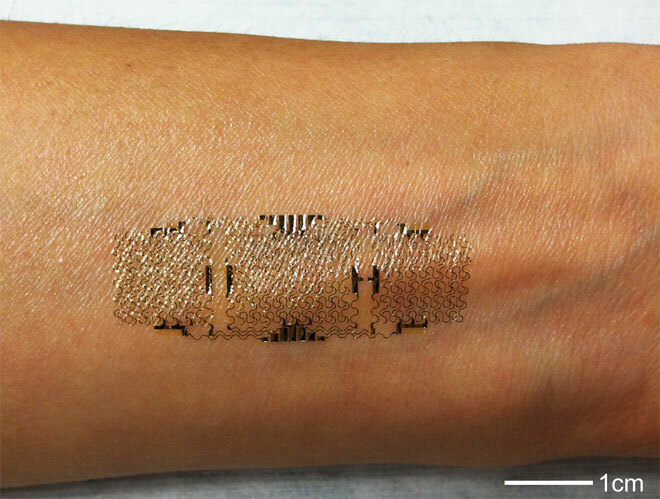 The epidermal electric system is either stamped onto the skin using a silicon wafer, or glued there with a water-soluble polyvinyl alcohol layer. Then it’s covered with spray-on bandage to keep it protected and watertight. After a couple of weeks, the layer will peel off as the underlying skin particles naturally exfoliate. But aside from natural skin shedding, it’s actually quite robust, says Rogers. To test its durability, they stretched and compressed subjects’ skin, over and over, to see how much the device could take. It lasted easily through 500 cycles, and through washings. It’s a lot more convenient than the electrodes that scientists used to connect to skin via a conducting gel. And it can offer more data, too, from high-resolution electric biopotential measurements, like electrocardiograms. Such a technology has many potential uses, from continual electrocardiogram readings, to precise measurements of temperature and hydration, to many other health and wellness readings. “That could be relevant for advanced surgical procedures, implantable devices, or even systems that are designed to do continuous health and wellness monitoring or to track the progress or accelerate the wound healing process,” Rogers says. “We’re interested not only in demonstrating concepts and an underlying scientific foundation around new measurement modalities through the skin, but also in their ultimate commercial realization,” he says. But the tool could offer more than self-measurement. Because of the detail in the signal received, it could be used as a human-machine interface — for example, a videogame or drone controller — based on signals from the user’s muscles. It’s really marrying fully integrated electronics to the skin, a non-permanent bionic interface.